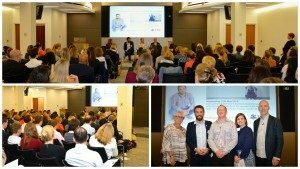 With huge thanks to UBS for hosting the annual mental health business breakfast on 12th May 2016. 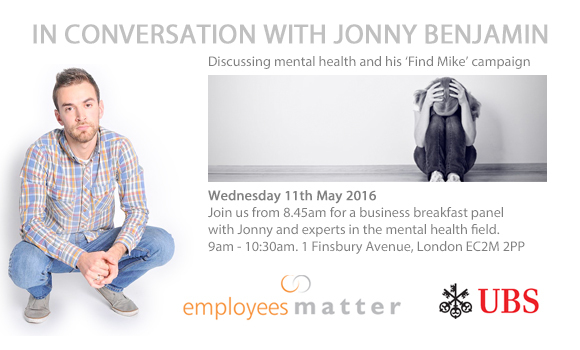 With standing room only 150 HR professionals listened to Zoe Sinclair, Director of Employees Matter, talk to Jonny Benjamin. Jonny’s story hit the headlines when he attempted to commit suicide from Waterloo Bridge and a stranger on his way to work helped him change his mind. Jonny’s ‘Find Mike’ campaign went viral a while later when he was well enough to reach out to this wonderful person who helped him. ‘Mike’, otherwise known as Neil discussed the day when he approached Jonny on the bridge and the aftermath of the ‘Find Mike’ campaign. Jonny and Neil were joined by Brian Dow, Head of External Affairs at Rethink Mental Illness and Benita Refson, Founder of Place2Be to discuss mental health in the workplace.